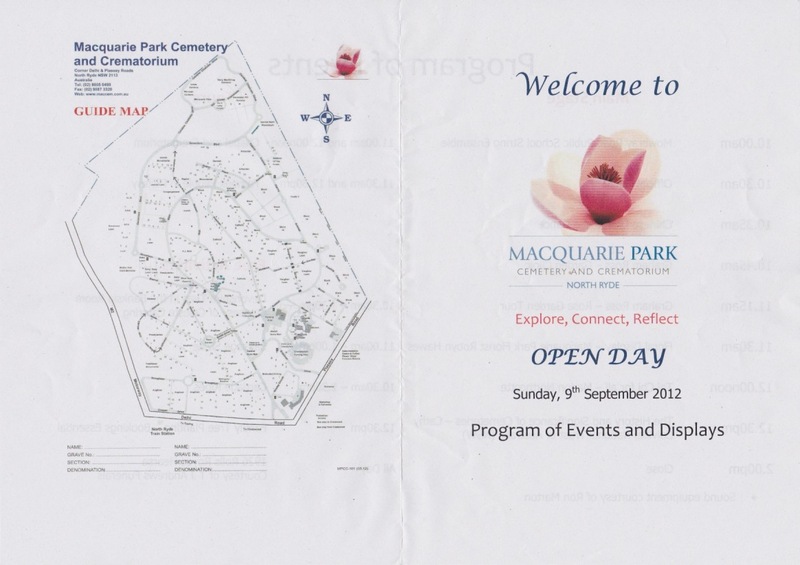 The other day I attended the Macquarie Park Cemetery & Crematorium open day. It was actually a fairly good day. Not as much as I would have liked. But a fun and friendly atmosphere with enjoyable stuff to do and see. When I got hope I posted the pictures I took here. But I didn't have time to explain them. It was an absolutely perfect day for it. Sunny and warm but not hot. A slight breeze but no wind. Which made me look forward to the open day. Being outside enjoying the weather and entertainment would be nice. My car, mostly out of sight. When I arrived I saw it was busy, not full but certainly had a crowd. So I parked in the crematorium car park. The crematorium car park is very close to the main buildings, and where the events were. Yet it has a lot of space and nobody really knows about it. As I entered the car park I noticed that my old spot was empty! This is a great little spot, slightly shady, close to the exit, easy to get into and (most importantly) out of sight. One of the important things about being an undertaker is to be discrete, not hidden but un-noticed. Often I would not want to be seen or noticed. So I found places to park that were easy to get in and out of and were slightly obscured. It was nice and nostalgic to find my little spot empty. After parking I went up to the events, following the sound of music coming from the distance. They had a decent stage and lots of chairs set up on a lawn next to the cafe. A group was performing a Chinese drum dance. It was a decent performance, well done and relatively interesting. Most of the seats were taken, but there were plenty of empty ones left. This was because most people had chosen not to sit in the seats but to sit on the walls nearby. It was interesting, that although there were proper seats people preferred to sit on brick walls next to gardens. In fact there was no where left to sit on the walls. Not because these walls were in the shade. Even parts of the walls that were in the sun had plenty of people. After the drum dancers Graham Ross gave a presentation on the history of the tomatoe. I did not stay for the whole thing as I wanted to see other stuff and go on a tour. But the presentation was good. Sure, his 'history' was simplistic and conformed more with popular beliefe than true fact. Yet it was entertaining and fun. He interacted with the crowd, giving out little gardening products here and there. It was quite enjoyable to watch and he did a good job. As I made my way to the main building to go on a tour I saw an old historic hearse. Historic hearses are unfortunately rare, it is cheaper in the long run for funeral homes to keep updating the hearses. So old historic ones tend to disappear. Yet here was an old and fancy hearse. A black Rolles Royce shinning away in the sun. Quite an impressive sight, and with no other hearse around it stood out. I went up and found it was a TJ Andrews Funerals hearse. The hearse itself had pictures all over it. They were photos of the old funeral home, such as of coffins being made and the premises of the original TJ Andrews location. It was really interesting and a great idea. To have the historic hearse with historic photos. Like a little portable museum. The hearse driver from TJ Andrews was standing by, handing out flyers. So I decided to talk with him. He was really nice and created a good friendly atmosphere around the display. 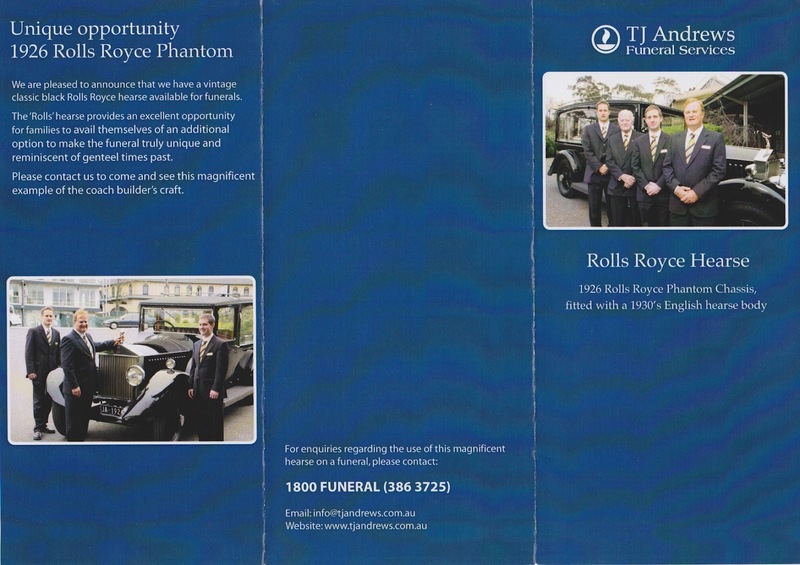 We got talking and he said how the hearse (called "the Phantom") is regularly sent on funerals. For about $900 extra one can have the historic hearse instead of a regular modern hearse. He also said that while it is a pain to drive (heavy, no power steering, no power breaks, etc) it has amazing power. It has a 12 cylinder engine, "the same engine used in spitfire planes". He was handing out flyers about the hearse to those who asked. Naturally I took one. It is a shame that they did not have anything about TJ Andrews or other stuff. The fly about the hearse is nice enough, but something about the funeral company would have been good. Perhaps about the history of TJ Andrews to go along with the history about the hearse. And about the services TJ Andrews supplies. Not only is it a missed advertising opportunity but it is a missed opportunity to learn about the company. A shame. But still impressive to see a rare history hearse. Cover of the TJ Andrews flyer. Inside the TJ Andrews flyer. You can read about the exact history of the hearse on the flyer. Just click and enlarge it or save the picture. It was a really fun and interesting display. But at the same time it was disappointing for two reasons. The first was how unpopular the hearse was. That here was a historic hearse, something rare and interesting yet not many people were coming up to have a look. The hearse is something that usually grabs people's attention and interests. There are a lot of interesting attitudes and hesitations about the hearse. Almost nobody outside the industry knows much if anything about a hearse, how it is made, what it is like, etc. So here is a hearse, a history one at that and yet there was little interest. People were much more interested in the horse and carriage ride. 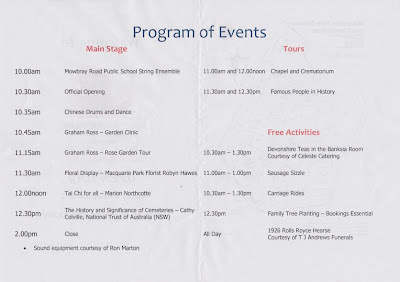 Sausage sizzle, hearse and carriage rides. The other thing is that it made me realise how sorely missed funeral display were at the open day. Appart from one hearse and the tour of the crematorium there was nothing really about funerals. It would have been nice to have other hearses on display. One would have hopped, even expected an open day at a cemetery and crematorium to have more about funerals. To have more from funeral companies. I really think they should have had something about grave digging, a little display to the side with a digger explaining how it is done and how long it takes. It is a really interesting job that deserves more attention. 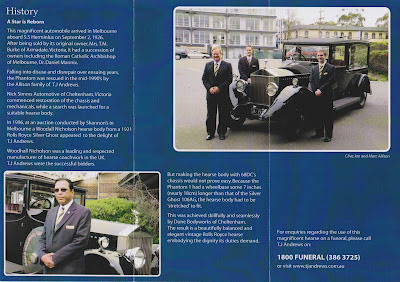 After I had seen the hearse and talked with the driver I made my way over to book a post on the crematorium tour. It would be interesting to see what they showed and said. Many organisations and companies hide anything to do with death or funerals. Take hospitals for example, only two in Sydney have "morgue" written on the door. The rest have a blank door that looks like a janitor cupboard. Also hospitals tend to place the mortuary around the back, out of the way. Between the kitchen and rubbish area and the loading docks. Buried in the services and out of sight of the public. 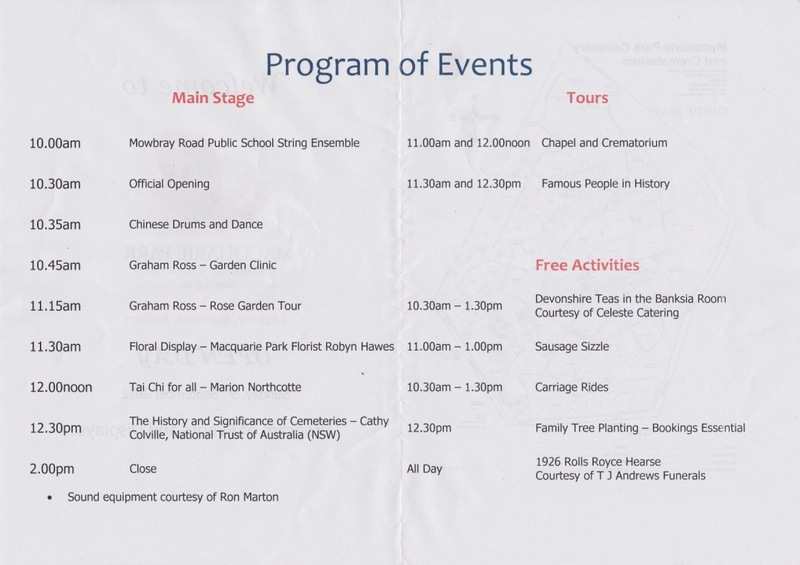 However when Westmead Hospital opened the mortuary as part of the open day it became the busiest and most popular place. Most people want to see this sort of stuff and have no issues with it. But companies (and many people) just think others do not want to see it. So I expected Macquarie Park to do the same. The tour would most likely be a publicity thing of the public areas. As in we would see plenty of the chapel, maybe talk about the cremation process but that would be it. I highly doubted they would show us much more than this. I also noticed that while there were a fair few people on the tour it had plenty of empty spots. Like the hearse the tour was not as popular as the stage performance or the horse and carriage rides. The tour group met at the main office and a little courtesy shuttle came to pick us up. Many in the tour were older and did not want to contend with the stairs down to the crematorium. After a fun little ride down we entered the first chapel and two concierge staff met us. They told us the standard stuff I already knew. Such as the chapels seat 200, but with overflow space they can hold larger services. One concierge said she was on a funeral of about 1,000 attendees. Which would have been interesting and difficult. Then they said something interesting, that the chapels are all deliberately designed to be similar and simple. This way the chapels can "quickly and easily be set up to cater to any custom" or religion. I had noticed that all three chapels are basically identical. The only difference is in the colour of the seats and curtains in the chapels. Other than that the floor plan, style, layout, size, everything is identical. I knew this was deliberate. A part of modernity is similarity and familiarity. That through each chapel being the same they feel safe, comfortable, known. Plus on a practical side if you know one chapel you know all three. This makes working out of them so much easier. However I had never thought of this in terms of setting up or customising for funerals. Quite and efficient and modern idea really. Compare it to other older crematoriums like Northern Suburbs (which is only 5 minutes drive away). The older crematoriums have different chapels, each chapel is designed to be individual aesthetically and physically. From a different doorway to different sizes and seating layouts. Then the modern Macquarie Park crematorium built recently has deliberately identical chapels save a superficial colour here and there. A dramatic difference in attitude and intent. The concierge then said in passing that they keep the chapels cool at all times as people get hot when stressed or upset. It is "nice" to go into a cool room like the chapel. It is interesting that they have actually thought about this, how people behave on a funeral down to the smallest detail. Right down to their body temperature due to internal emotions, not due to the external environment. Other than that the two concierge's mostly promoted the crematorium. Talking about things like the good acoustics, how practical and easy it is and so on. They were both friendly, and were not pushy. So it did not feel like a sales pitch so much as a positive description of the company and of the place. So far they were also being very open about everything. The Audio Visual room where the concierge sits was open and on display. The room is in the foyer, to the left as you enter the chapel. Even though it has expensive equipment and is normally a 'hidden' place where only staff can go. They then showed us the "family room" which is in the foyer of the chapel opposite the AV room. It is interesting how this type of room has changed. Once it was called "the crying room" and a place where people could cry during a funeral without being seen and/or without disturbing others. However over time it has morphed into a children's room. You can see how toys and kids books are now being placed in these rooms. And how these rooms have gone from being hidden to being more obvious and having a better view of the funeral service. The family rooms at Macquarie Park are a perfect example of what it has become in contemporary society. Each family room has a box of decent toys, a large window to see the service and couches to sit on. It is a nice room and well labeled, not hidden or hard to find. We made our way further into the chapel, down to the front where the podium is. The concierge explained that "people are always fascinated by the curtains". This was strange, of all things to be interested in at a crematorium the curtain are hardly the top of my list. But then I realised, the curtains are very important on a funeral. Closing the curtains is the last time people see the coffin, it is the act of 'committal' and quite significant. The curtains and their closing come to represent the final departure of the coffin and deceased. Plus I also remembered how the undertakers would get excited at opening or closing the curtains. And if the concierge did it for them they were often disappointed. Really, the curtains are not just emotionally significant but fun. We all like to play with things like curtains. Podium at the front which controls the curtains. The concierge told us more about the chapels. How the services are recorded onto DVD if requested. How all chapels have nice silk flowers (which can be left or removed as needed). She then told us about strange things put in the coffins that do not burn during cremation. Such as dog leads. We were also told about things like pacemakers which need to be removed as they explode in the crematorium. Catafalque used during the funeral service. Next the concierge showed us the catafalque. Basically this is a trolley on wheels. The coffin is placed on top of it and can be wheeled through the chapel, then left up the front to be displayed. All crematoriums have different catafalques. Some are like a fixed podium up the front. But Macquarie Park has the best ones. They look ok, but more importantly are easy to use and quiet. The squeal of wheels is not nice for a catafalque. The concierge talked about how the coffin is taken out through a hidden door on the catafalque to be taken to the back rooms. Then they did something which shocked me. They opened the door and guided us through to the back rooms. I knew Macquarie Park is open and friendly about its operations yet I did not expect this. We went through to the actual cremation room. Here another guide how worked in the back rooms took over. He explained the cremation process which I have talked about here. You can also watch a video of the process here. 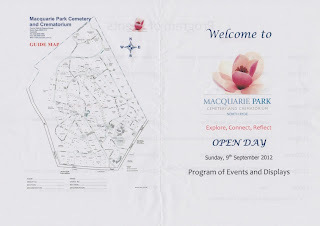 I was just surprised that Macquarie Park was publicly and openly taking us through the back areas. Not only that but they were quite happy for me to take photos of things. Control panel for one of the burners. The new guide told us about how they have a "witness room" right by the 'burners' (or retorts). This is for mourners to watch the coffin being put in the burner and cremated. Some religions and customs emphasises this, or they might just want to see it. Until now I had heard that this was all but impossible in Australia. Many undertakers and crematorium staff have told me that for OH&S and legal reasons they cannot and do not let the public into the back rooms. Yet here Macquarie Park was raking us through on a tour and has a special room dedicated to letting people watch cremations. coffin is place into the machine. He also told us about the burners. How they have two 'Newton' burners and one 'Dual' burner. The Newtons are standard burners, however the Dual burner is larger and designed for 'oversize' (obese) coffins and bodies. It reflects the physical changes in people. That new larger burners are being built and bought. As we get bigger our deaths get bigger. These burners are all top of the line fancy things. They are completely automated and data is sent to Melbourne as they operate. Once ashes that were sent to space needed proof of how long and hot they were cremated for. The date was retrieved from Melbourne, not from Macquarie Park in Sydney. All the staff need do is put the coffin in and press start. It then does the rest for them, telling them when it is "finished". To the side of the burners is a holding room. This is a large cool room where coffins can be stored. Quite often there are too many coffins to be cremated in one day. So they are stored to the side until the next day. This is where the ashes are collected at the end. I was interested when the staff assured everyone that they do not open the coffins or take longer than 24 hours to cremate a coffin. All they do is remove the nameplate and large metal handles (although most handles are plastic now). It was interesting that they needed or wanted to say this. There is a strong rhetoric both about and from the industry. About it in terms of the dodgy stuff staff supposedly do (which they do not do). And from it in terms of staff repeating or emphasising how they do not do these things even when it is not brought up by others. It is sad to see the decent staff fell the need to reassure people about their practices and behaviour. As though they feel others assume them to be dodgy or dirty. After they talked a little more we made our way out to another chapel. They told us to sit and then an organist started to play music. This was apparently the end of the tour as they 'encouraged' us to relax and enjoy the music. Obviously a selling point. Getting us comfortable with the location while simultaneously getting us to experience the services provided by the location. I did feel sorry for the organist, she was quite good and people just started to walk out slowly. She had to sit there and play her best as people just walked out on her. It was a really awkward end to an otherwise good tour. next time I would end it in a chapel, but have displays in the chapel as the organist played in the background. Placing tabels and photos out would be nice. Photos of the history of the park, interesting events, current staff, and so on would be a better sales method and more fun for people. Having someone play as we walk out is just awkward and unfinished. I left the chapel and made my way around the other chapels. They were all open so I went inside and took photos. It was quite nice actually, the way they were open and obviously encouraging people to look around them. However again I felt they needed more. Some displays and a staff member to chat with people would be nice. With such a good opportunity I decided to take lots of photos of the chapels. I will post all of these one day, and talk more in depth about Macquarie Park. It was really fun to walk about taking the photos without people getting in the way. And I saw a lot of the chapels. When i was done taking photos of the chapels I headed back to my car. I decided to drive around the cemetery, to see how busy it was and because it was such a nice day. As I drove about the cemetery I noticed it was actually quite busy. Many people had come for the open day, but then gone on to visit grave. Obviously efficient and nice for many people. This was fun, but also irritating as many people had not thought about where they were parking. One cannot park in a cemetery as one does on the street. Parking right next to a round about in a cemetery is just annoying as the road is narrow and the bends are tight. But this was not too much of an issue really. Most people had parked fine and it was not that bussy. I went to Ascension Hill, a new section of the cemetery opened in 2011. It was interesting to see that in just one year so many grave had been bought. Also the fancy life size statue was worse for wear. It has obviously become a resting place for pigeons and become dirty. Not a good look for a cemetery, but a natural look. It was interesting to see the mix of nature, city and cemetery. On one side of Ascension Hill is a nature reserve, so there are a lot of native trees and birds. You can clearly hear the birds. Yet there are also large power lines running through and in the back ground there are the large city buildings of Ryde. Every now and then a plane will fly over and drown out the birds. Or you will hear the cars on the wind in the distance. Nature, city and cemetery all merge and mix on Ascension Hill to create quite an interesting place. Small statues line the paths at Ascension Hill. Next I found myself at the baby lawn. This is the space in the cemetery where infants and children are buried. It is very different to any other lawn in the cemetery. The graves are almost always decorated in children's things, from toys to stickers. There is also a lot more colour here, the toys are bright and vivid and the grave markers are shiny. Further more there are benches and tables, like in a park. Except they are a bright cream and green roof. The whole place is surrounded by short hedges so it feels separate from the rest of the cemetery. To walk into the boby lawn is to leave Macquarie Park. Much more colour than other parts of the cemetery. Some of the decorations have been damaged over time. I noticed to the side there was a large sculpture, so I moved over. It was built by school children for the baby lawn. Although simple it was a good sculpture. The colourful pebbles around the base were particularly good. I did not expect to see a sculpture in the cemetery, especially in the baby section. Normally people take issue with using a cemetery for anything other than burials. There has been debate about letting people jog or cycle through cemeteries. After I was done in the cemetery I headed back to the events for one last look. It was still as busy as when I arrived and the sausage sizzle was underway. Overall it had been a great day, fun and interesting. The Macquarie Park staff were all there and enjoying themselves. They really did help to create a relaxed and fun atmosphere. To see staff in their uniforms mixing with the crowd and having fun was great. Most people there were older, 50s or up. But there were also quite a few children there with their parents. I noticed there were very few teens or young adults at the open day. However there were a few scattered here and there. It was also the right number of people. There were enough people to create a crowd and fun vibe. yet not so many as to feel crowded. Because of this there were still plenty of car parks, spaces on the tours and chairs and sausages for everyone. Yet everything had people so it did not feel empty. My only regret is that they did not have enough variety or information. A few displays about history of the place or other funeral company things would have been great. Maybe they could have offered hearse rides along with the carriage rides. Overall it was a great day and I had plenty of fun while learning a lot. There is no doubt, I am going again next year! Plus they had plenty of free food! !